Asian communities throughout the world will mark the Lunar New Year beginning Jan. 26 with festivities that include plenty of food, firecrackers (to chase away evil spirits), red paper lanterns (red being a bright color that portends a sunny future) and dragon and lion dances for good luck. (In the dances, a group of performers holds up a model of the animal's head and a long train symbolizing its body and moves sinuously as a way to demonstrate power and dignity  no lions or dragons are harmed.) 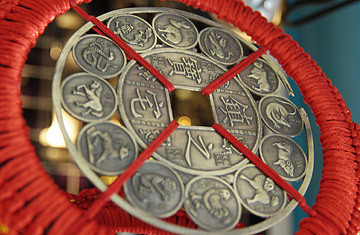 Such traditions are rooted in an astrological system that dates back to the Shang Dynasty (about 1700 B.C. ), when soothsayers would burn turtle shells or shoulder blades of goats or cattle and use the cracks to interpret what the future held. The remains of these "readings" were unearthed years later and called dragon bones. Although these methods weren't specifically astrological, the period marks the beginning of the Chinese connection to the celestial bodies that form the basis of the Chinese zodiac. Because the Chinese calendar is based on the moon's rotation, the new year can occur anytime from mid-January to late February. According to legend, the calendar was created by Ta Nao, a minister of Emperor Huang Ti's, and has been used in Asia since 4000 B.C. It is based on 12 temperaments represented by 12 symbolic animals  rat, ox, tiger, rabbit, dragon, snake, horse, sheep, monkey, rooster, dog and pig (the dragon being the well-known favorite). After 12 years, the cycle restarts, matching the length of Jupiter's solar orbit. Each animal in the zodiac is associated with its own element  metal, wood, earth, water or fire  while each year is assigned an element. The combination of these two elements is said to define a person's personality. For example, 2009 is the year of the earth ox, but the ox's fixed element is water; the mix of the two elements, earth and water, is believed by some to be a destructive blend. A Chinese astrologer takes all these factors into consideration when charting an individual's personality or determining what a new year will bring. These predictions aren't just for carnival sideshows or fortune cookies: in many Asian cultures, each year's forecasts are studied carefully for portents relating to business, romantic and family decisions for the coming year. Some Chinese plan births during dragon years to improve their children's fortune. Some people born in "wrong" years have reportedly been excluded from attending weddings and funerals. As for those making plans for 2009, be warned: because the element of fire is lacking from this year's forecast, fortune tellers don't believe the economy will fare any better than it did in 2008's year of the rat. See 10 things to do in Shanghai.